Who is this elusive character? Welcome to Who Is Theodore Us? This blog will in no way attempt to answer this question but instead chronicle my time spent wargaming and painting. I typed that title and had a little moment of 90's Amiga nostalgia. Anyway, the last two weekends have been pretty DIY centred, so not much painting going on. My Wednesday game was postponed, so no wargaming either! 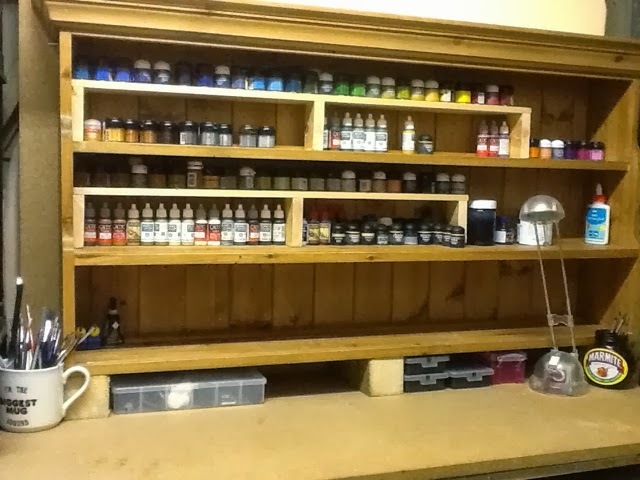 However, I have managed to revamp my workbench, which was very satisfying. I'm very fortunate to have an area in the house where I can paint and leave stuff out, but it does get very very cold in the winter. So last weekend I insulated the external wall, and this weekend I extended and raised my desk to give more workspace and hopefully less back-ache. It doesn't look pretty, but it's functional and was made entirely from bits of wood I had lying around. Now it's time to make it untidy by covering it in models in various states of completion! TheMetalBikini.com- X-Wing Miniatures content updated daily through the week!